People from Russia, Ukraine, Belarus, and other former Soviet republics, who are interested in Wirtland, can now use the Russian version of Citizenship Application Form (see sample here). Russian became the 7th language in which the Wirtland Citizenship Application Form is available, in addition to English, Spanish, Bulgarian, Portuguese, Turkish, Thai. The translation was contributed by a witizen from Russia, who also initiated the "Russian Group" at Witizens of Wirtland Network. All Russian speakers will be welcome at the "Russian Group". Other important Russian-language resources related to Wirtland include the entry in Russian Wikipedia, an article from Russian national radio, and a recent article in Ukrainian numismatic magazine about the "Wirtland Crane". The Facebook support group for Wirtland's Global Antiwar Party also features a Russian translation. An automatic Russian translation of all "The Times of Wirtland" can be found here. 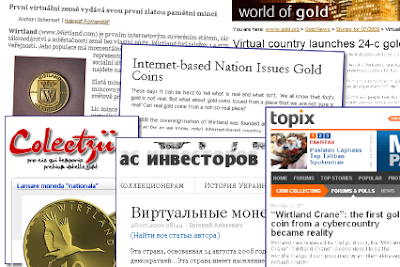 Last month Wirtland released the "Crane" - the world's first physical gold coin from virtual land. The birth of Wirtland Crane was widely covered by international media (see list below). Though most of publications are in English, we have spotted also articles in Romanian, German, Russian, Ukrainian, and Czech media. The first sales of 1/10 ounce 24-carat pure gold Wirtland Crane proved successful as well. 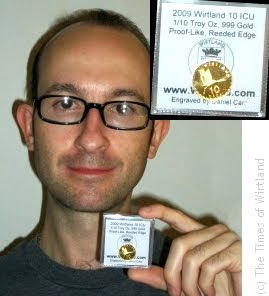 "I received the Wirtland 10 ICU, and I really think it's a gorgeous coin!" - said Erik V. McCrea, coin collector, who was the first buyer of Wirtland Crane (see photo below). "The Wirtland Crane is truly a work of art! And that is what I value the most – top-notch artistry combined with numismatics." Erik, who is a painter, teacher, and collector of unusual coins from USA, tells his story: "I basically began collecting coins because my father had travelled a great deal as an engineer. For years to come, my main goal was to get at least one coin from every country. After all, it was getting harder and harder to find coins from "new" countries. But in the mid-to-late 1990s, I began to be interested in the types of coins featured in the catalogue "Unusual World Coins". Many of those coins brought back the thrill and the excitement about this hobby". Tom Havelka, another owner of Wirtland Crane: "My Wirtland coin is absolutely beautiful! It will make a fine addition to my collection of coins from unrecognised states, and it is the first gold coin I have in that collection. Congratulations on a wonderful addition to the numismatic world!". Sale of Wirtland Crane already has been spotted on eBay, which means the popularity of the coin is growing. The price of Wirtland Crane is currently 135 US dollars for collectors and 120 US dollars for gold investors, who purchase 10 coins or more. Shipping cost is always 5 US dollars, a flat rate for any country and quantity of coins. How competitive is Wirtland Crane in comparison with other gold bullion coins? In weight and gold purity the Wirtland Crane is similar to Canadian "Gold Maple Leaf". Its retail price is $133.95 at Nwtmint.com*, plus standard shipping cost $20 within USA. Other popular 1/10 ounce gold coins, like South African Krugerrands, have lower percentage of gold (22 carats, or .917 gold). A purchase of ten pure .999 gold coins including delivery will cost: $1360 for Maple Leafs from Nwtmint.com, or $1205 for Cranes from Wirtland's mint. The buyer saves $155 in Wirtland. Regarding discounts for wholesalers and other details please email Mint (at) Wirtland .com. The Wirtland's "crane family" will grow. The next coins will be 1-ounce silver and 1-ounce gold Wirtland Cranes. * That mint's current price vary because gold price changes. Wirtand's price is always fixed. 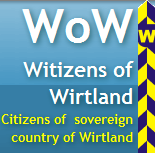 You may help Wirtland by copying and pasting this banner to your site. To recognize the achievement of outstanding merit or distinguished service to Wirtland in every field of endeavour, the Orders and titles of Knight of Wirtland and Dame of Wirtland were instituted by special decree signed by Chancellor of Wirtland on August 14, 2009. The Order of Knight of Wirtland and Dame of Wirtland has three grades, and can be bestowed upon citizens of Wirtland or foreign citizens. If the Order is bestowed upon a citizen of Wirtland, it is accompanied by the title Knight of Wirtland (K.W.) or Dame of Wirtland (D.W.). The titles are hereditary. As citizens of Wirtland, Emil Dimitrov and Romeo Ninov also receive the hereditary titles of Knights of Wirtland; Ruma Kostadinova receives the hereditary title of Dame of Wirtland. Congratulations to Mr. Daniel Carr, Knight Emil Dimitrov K.W., Dame Ruma Kostadinova D.W. and Knight Romeo Ninov K.W.! On August 14, 2009, the song written by renown French composer Mr. Michel Legrand "Watch What Happens" (listen sample here or MP3 here) was approved as national anthem of Wirtland, by a special decree signed by Chancellor of Wirtland. 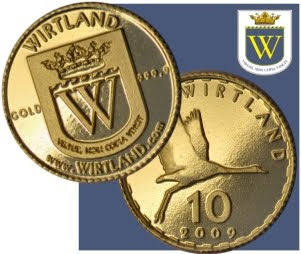 >> Coins: Wirtland Crane gold coins are sold directly from our official mint. Silver Cranes will become available soon. 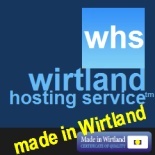 >> Clothing: Wide choice of Wirtland clothing and merchandise is offered by our gift shop. Purchase of coins and merchandise means support to Wirtland, because a percentage from each sale goes to Wirtland budget. August 9th, 2009 – In connection with the first anniversary of the Russia-Georgia armed conflict that erupted on August 7-8, 2008, The Government of Wirtland expresses concern about new tensions between Russian Federation and Georgia, building up military presence in the Transcaucasian region, and warlike propaganda in the mass media. Wirtland invites all Georgians and Russians who are against the confrontation between these two nations to unite their antiwar voices by joining the Global Antiwar Party. As a supranational entity, Wirtland is independent from any other country and has the unique possibility to unite people from the opposing countries into a common organization. Global Antiwar Party (GAP) is open to any adult citizen of any country, and offers equal representation opportunities to people from any national, ethnic, or religious background. The Government of Wirtland hopes that the active position of citizens, who are opposed to confrontation between Georgia and Russia, will help to overcome warlike intentions and eventually settle the conflict in a peaceful way.